When I came there I had been on the road for several months, and had not seen a European face for long, long time, and I had started to "worry" a little bit about it. I had been "hiding" myself from the World in magnificent mountain scenarios, with wonderful temples and explored exiting, far away islands. The two Europeans actually turned out to be Americans, and they looked quite funny in their immaculate coat and tie with perfectly ironed snow white shirts, and black polished and spotless shoes. 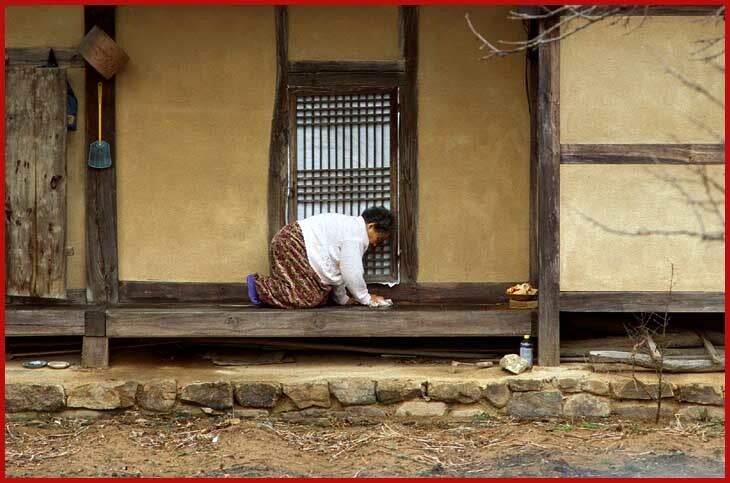 They were not there because they wanted to be there by their own free will, but because they had been assigned to teach the Korean people some kind of religion, - and as it could be expected they did not like Korea at all. This was quite contrary to my own objectives: I loved Korea,- and I had absolutely NO desire to change the moral or thinking of the Korean people, - and I saw absolutely NO sense in giving them a new religion that did not fit in at all. 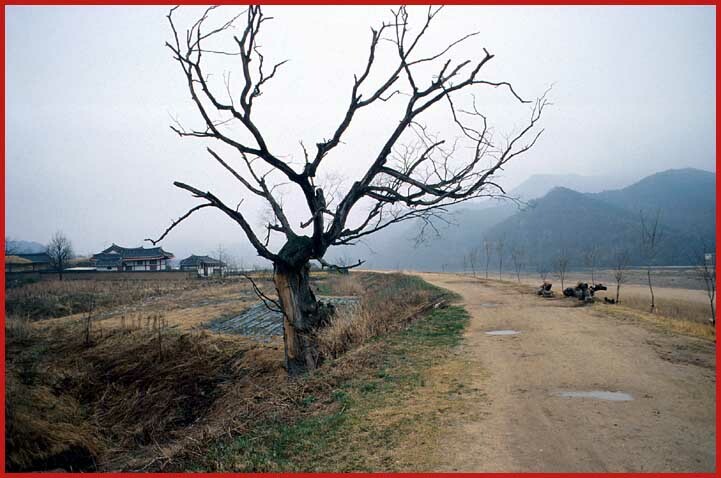 Hahoe is a remote village, where time seems to have been stopped for more than 500 years. 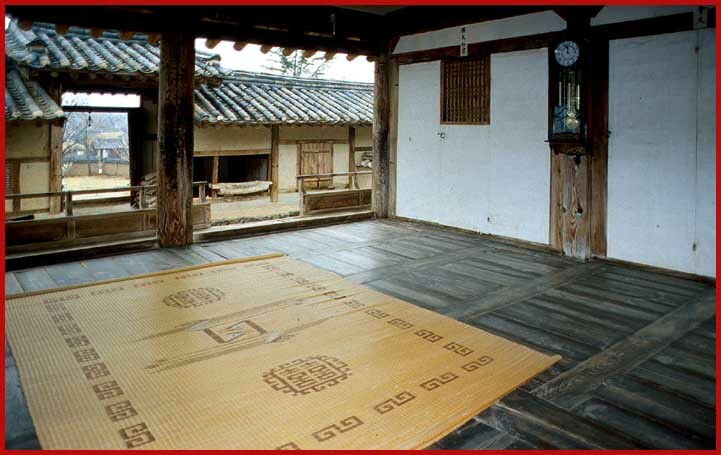 Actually it's so traditional,- that the Korean government has decided to proclaim it a national treasure. This is fully understood, because Hahoe is indeed very picturesque, and obviously a photographers dream. 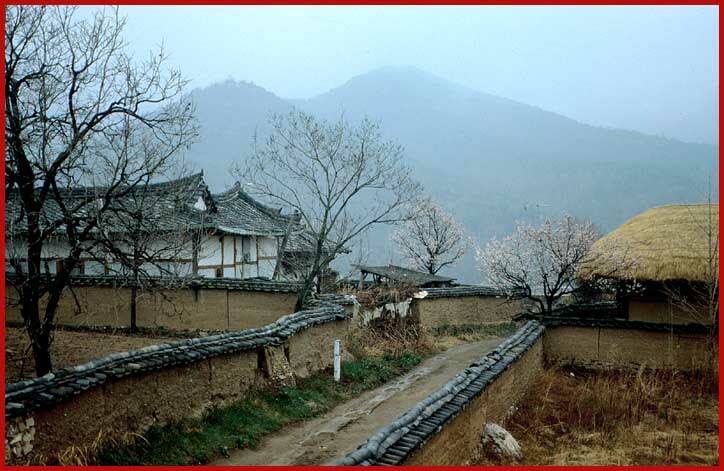 It's the most picturesque village I have seen in Korea! 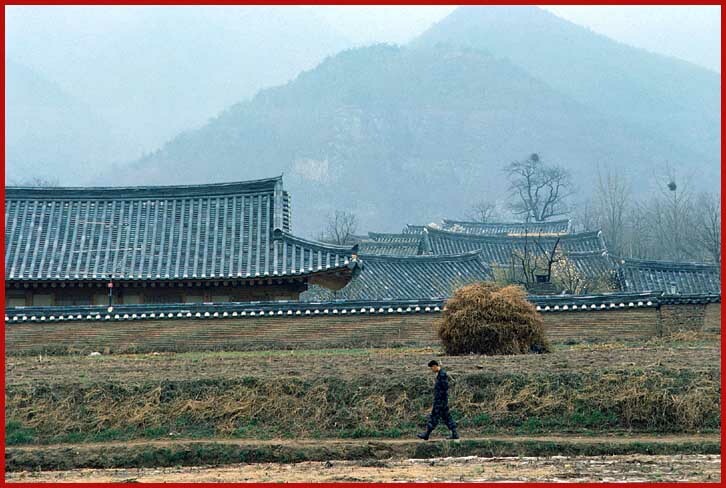 In fact it is so good, that Korean film makers often use this village as scene for historical movies. 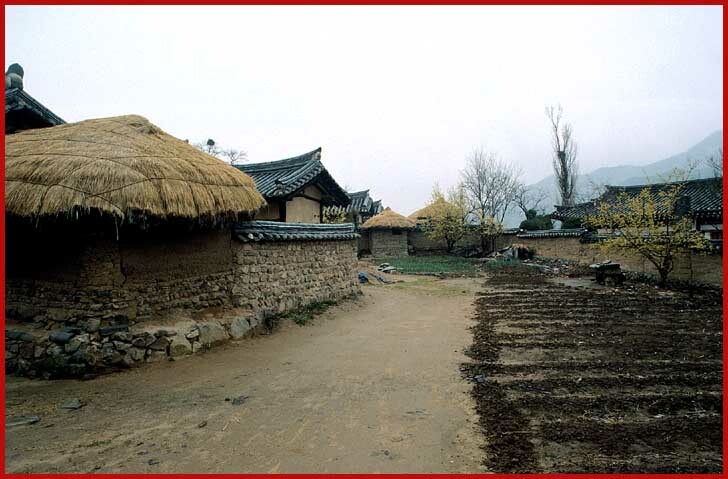 No need to build expensive replicas in the fancy film studios of Seoul, because here in Hahoe is the real thing right in front of your eyes! 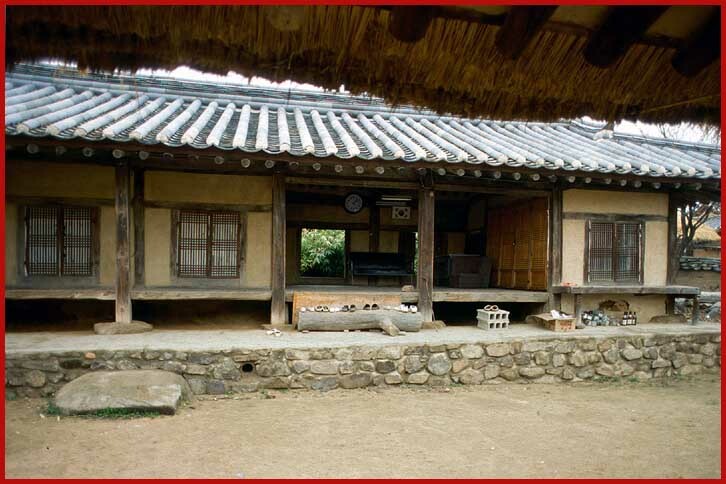 However,- that does not mean that modern obstructions does not exist in Hahoe. The farmers use motorized machines,- and of course there are also TVs and cars, and all other things that the population in the big, modern cities enjoy, -but on the pictures I have displayed on this page,- I have carefully avoided those 20th. century inventions. You won't see them on my pictures! 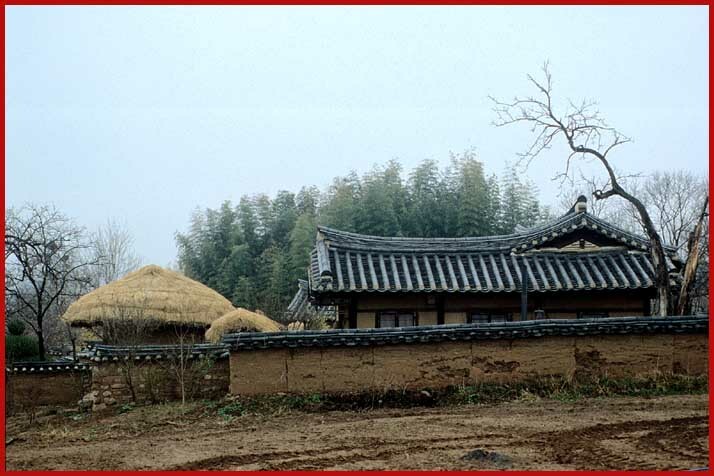 Here a closer look of a typical Hahoe house.